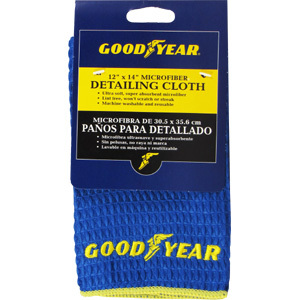 Good Year's Detailing Cloth is excellent for cleaning a variety of interior and exterior surfaces, including paint, glass, leather and vinyl. This cloth saves time and effort, but most importantly, it totally eliminates cloth-inflicted streaks, smears and swirls, producing an entirely new level of clear reflection and deep gloss. The cloth can be reused after a wash. This is an excellent all-purpose cleaning cloth. I am very happy with this product and am glad I found it for so cheap. Michael "Gets the job done"
This leaves my car looking like it did when I first took my first ride. I love how you can use it with wax polish! Microfiber Detailing Cloth - 1 pc is shipped in a discrete, unmarked package. Orders are processed immediately and usually takes about 3 to 5 working days to be received. We do ask that you try it for 2 to 3 weeks to feel the full effects. Any information received is used only for order processing and shipping purposes. Your information, such as e-mail address, will never be disclosed to a third party.